An individual sequence of instructions to be replaced with a call to an outlined function. Definition at line 37 of file MachineOutliner.h. Definition at line 120 of file MachineOutliner.h. Definition at line 126 of file MachineOutliner.h. Definition at line 107 of file MachineOutliner.h. Referenced by llvm::AArch64InstrInfo::getOutliningCandidateInfo(), and initLRU(). Definition at line 106 of file MachineOutliner.h. Returns the call overhead of this candidate if it is in the list. Definition at line 104 of file MachineOutliner.h. Return the end index of this candidate. Definition at line 94 of file MachineOutliner.h. Return the number of instructions in this Candidate. Definition at line 88 of file MachineOutliner.h. Definition at line 109 of file MachineOutliner.h. Definition at line 108 of file MachineOutliner.h. Return the start index of this candidate. Definition at line 91 of file MachineOutliner.h. Compute the registers that are live across this Candidate. Used by targets that need this information for cost model calculation. If a target does not need this information, then this should not be called. Definition at line 138 of file MachineOutliner.h. References llvm::LiveRegUnits::accumulate(), llvm::LiveRegUnits::addLiveOuts(), assert(), back(), llvm::for_each(), front(), llvm::MachineBasicBlock::getParent(), llvm::MachineFunction::getRegInfo(), llvm::LiveRegUnits::init(), MI, llvm::MachineBasicBlock::rbegin(), llvm::LiveRegUnits::stepBackward(), and llvm::MachineRegisterInfo::tracksLiveness(). 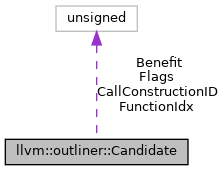 Used to ensure that Candidates are outlined in an order that preserves the start and end indices of other Candidates. Definition at line 130 of file MachineOutliner.h. Set the CallConstructionID and CallOverhead of this candidate to CID and CO respectively. Definition at line 98 of file MachineOutliner.h. The number of instructions that would be saved by outlining every candidate of this type. This is a fixed value which is not updated during the candidate pruning process. It is only used for deciding which candidate to keep if two candidates overlap. The true benefit is stored in the OutlinedFunction for some given candidate. Definition at line 118 of file MachineOutliner.h. Identifier denoting the instructions to emit to call an outlined function from this point. Definition at line 65 of file MachineOutliner.h. Referenced by llvm::AArch64InstrInfo::insertOutlinedCall(), and llvm::X86InstrInfo::insertOutlinedCall(). Target-specific flags for this Candidate's MBB. Definition at line 82 of file MachineOutliner.h. The index of this Candidate's OutlinedFunction in the list of OutlinedFunctions. Definition at line 61 of file MachineOutliner.h. Contains physical register liveness information for the MBB containing this Candidate. This is optionally used by the target to calculate more fine-grained cost model information. Definition at line 72 of file MachineOutliner.h. True if initLRU has been called on this Candidate. Definition at line 85 of file MachineOutliner.h. Contains the accumulated register liveness information for the instructions in this Candidate. This is optionally used by the target to determine which registers have been used across the sequence. Definition at line 79 of file MachineOutliner.h.